I had never had Maafe until Priya asked if I had a recipe for it. This lead me to be officially in love with the stew. Although I have an allergy to peanuts, it’s not that bad with the butter (no idea why 🙂 ). Sometimes I enjoy making Nigerian soups with a vegetarian twist and sometimes with mushrooms, but I never thought about making groundnut soup this way. This soup, although a vegetarian style is very rich in flavor and was so beautiful after the cooking process. 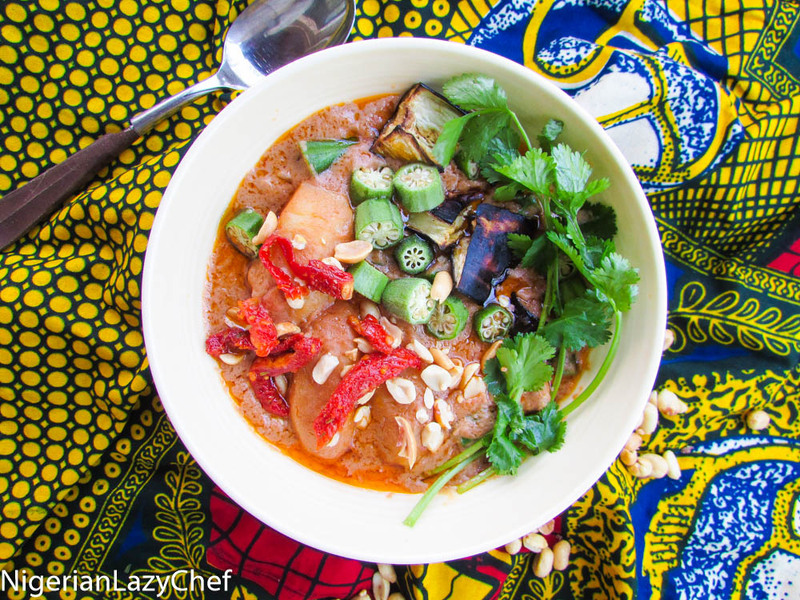 Before I made this dish I had always tasted groundnut soup from my neighbor who always cooked it for her Ghanaian husband. She added a lot of meats and dry fish to it, but I never really asked her how she prepared hers’ until I discussed with Priya about making some. Oh was I a little nervous but I knew exactly who to run to for a little help. Freds who also blogs about African cuisines. After studying the three recipes she gave, I decided to go with the Senegalese Maafe , but with my own twist to it. I have tried the Nigerian style, but I really prefer this style. I hope to try it with some meat some time soon. wash and cut the egg plants; then season with salt, pepper and oil. then roast in the oven on 400 degrees or simply sauté in a little oil and set aside. Heat the oil, sauté the onions until translucent. Add the potatoes, garlic and ginger. Sauté until fragrant. Add the tomato paste sate for about three minutes; then add the chopped plum tomatoes and cook until almost reduced(about 3 minutes). Pour in the mixed peanut and add another ½ cup of stock or water. Bring to a boil, reduce the heat and simmer for 45 minutes to an hour; making sure to stir occasionally to prevent burning. You will know the soup is one once the oil floats to the top. Stir in the egg plants and okra, check for seasonings. Cook for another 3 minutes in order not to over cook the okra and egg plants(you could steam the okra separately and serve it with the soup) serve with any side. I like mine with rice. This entry was posted in Gluten free recipes, Peanut butter soup, Peanut butter stew, Sauces, stew, Stews, Uncategorized, Vegetarian/Vegan recipes and tagged African peanut butter stew, African peanut soup recipe, African peanut stew recipe, African peanut stew with egg plants and okra, African vegetarian peanut soup recipe, African vegetarian peanut stew recipe, maafe recipe, Senegalese ground nut stew recipe. 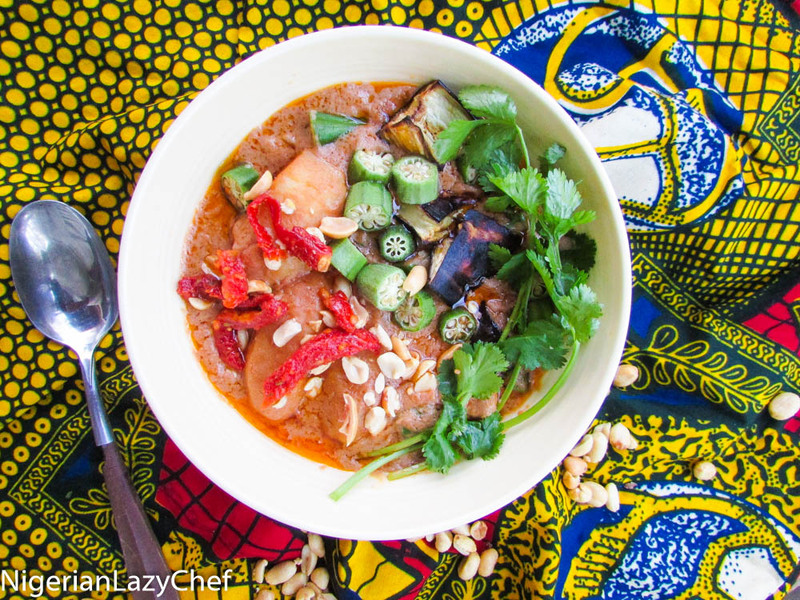 Nigerian food blog, Senegalese maafe recipe, vegetarian peanut butter stew recipe, vegetarian peanut nutter soup recipe, vegetarian senegalese maafe recipe. Hi Nma. Well done. Please do you have a recipe for oil less stew or stew with as little oil as possible? Ok. Thanks for responding. Will do.